At the beginning of November I was asked to join a panel entitled “No One is International” as part of Huron College’s Centre for Global Studies‘s symposium “Critically Engaging: Global Awareness in the Academy.” As I considered the panel’s title, and the broader purpose for the conference (to critically engage with the meaning of “internationalization” for the college), I decided to frame my reflections around a central question related to my work as a historian of Canada: What does it mean to teach Canadian history (that is, the history of the nation-state) from a non-national perspective? In both cases, the immigration and transnational approaches are supported by the key assumption that we know and understand the categorizations and dynamics at play within colonial worlds (and believe that they are fully knowable). Though there is a lot of merit to both approaches – and there are important exceptions to the divisions I’ve made above – I’m not completely satisfied with either in terms of structuring our thinking about the teaching of Canadian history. If we’re going to embrace the lessons that critical reflections on colonialism have taught us in the academy, we need to be much more open in our thinking and willing to re-conceive our categories of analysis. Source: Nonenmac, http://commons.wikimedia.org/wiki/ File:Akwesasne_Territory.gif. Licensed under the Creative Commons Attribution-Share Alike 3.0 Unported licence. With this in mind, when I think about what Canada is, and means, my attention is often drawn to the histories of three groups of people: the Passamaquoddy, the Mohawk, and the Siksikaitsitapi (Blackfoot Confederacy). When Canada and the United States agreed to the line that would divide them, each of these peoples’ territory was split into two national jurisdictions. For the Passamaquoddy, the border has meant official recognition in the United States, while remaining unrecognized in twentieth-century Canada. Don Soctomah, a Passamaquoddy Historical Preservation Officer, explains the legacy of this division on Ronald Rudin’s Remembering Acadie website. The provincial/state borders of Ontario, Quebec and New York State divide the Mohawk community of Akwesasne. Tribal identity extends, therefore, over the international border. The National Film Board’s Indian Film Crew shed important light on the tensions posed here in the film You Are on Indian Land. Similarly, in the places that most of us know as Alberta and Montana, the Canada-US border similarly divides the Siksikaitsitapi. 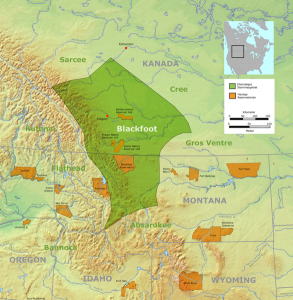 The Blackfeet Indian Reservation, for example, is rigidly shaped by the 49th parallel. But here again, the Siksikaitsitapi remain united despite these divisions. In these three examples we can see how the nation-state obstructs and subsumes alternative political geographies that are deeply meaningful for people putatively living within Canada or the United States. That these Indigenous territories remain disputed spaces, tells us something about the nation-state in North America: It isn’t what we think it is and it doesn’t have the qualities that we too often uncritically associate with these political entities. The Supreme Court of Canada’s recognition of Tsilhqot’in Aboriginal Title to Tsilhqot’in Nen (their land) between the Fraser River and Coastal Mountains, the persistence of Passamaquoddy claims against the Canadian state on the Atlantic Coast, and the existence of Kawehnoke Island – a part of Akwesasne in the St. Lawrence River that is literally situated between Canadian and US Customs (but officially part of Ontario) – all point to a different interpretation of the national political environment in which we live. This one anchored in Indigenous mobility rights and, importantly, recognized by the United States (but not Canada) through the late-eighteenth century agreement between the United States and Canada commonly known as Jay’s Treaty. You don’t have to spend much time in a history classroom to realize that there are at least two reasons why acknowledging this problematic binary framework is important. In many Canadian history courses the implicit (though often unintentional) message communicated to students is that courses are taught by faculty, and to students, who symbolically represent “us” (Canadians). A problem arises, however, because the way that “we” are defined is shaped not only by the terrestrial borders questioned above, but also by conceptual borders shaped by our notions of race, class, language and gender. These borders – often implicit in how we teach and learn Canadian history – tend to privilege some people over others (often, but not always, White, (upper) middle-class, English/French speakers, and men). Relatedly, the second reason to acknowledge this problematic framework is because a perceived historical division between “us” and “them” has legitimized and made easier the mobilization of a “nationalized public” in support of violent policies that alienate and dispossess those people whose view of society counters the definitions of the nation-state. In our classrooms are some students who, though they grew up within Canada’s borders, have had experiences that are completely foreign to these nationalized stories about the past. Though to illustrate this point I have used examples from Indigenous communities whose homelands span the international border, I could have used similar examples that address socio-economic, gendered or geographic differences (between rural and urban or southern and northern communities, for example). The central point here is that in our classrooms – and more broadly within Canadian society – are people whose lives have been directly touched by violence and vulnerability caused in part by the political deployment of a nationalized vision of the past. Breaking down the binary then (a role well suited to “critically engaged” liberal arts programs) points towards the possibility for a less violent future whereby the nation-state cannot be used as political leverage reinforcing the will of the state or political elites. Additionally, it allows us to teach about the history of the nation-state from an inclusive framework that accounts for, and respects and addresses, our students’ (and broader audiences’) diverse racial, class and gendered experiences. For the historian of Canada this means teaching and writing about Canada’s history without privileging the position of the nation-state and its champions; it means seeing beyond the national/international binary towards a more fluid and flexible accounting of the past; it means approaching the history of the nation-state from the perspective that it might not be what we thought it was. I have often thought that, while one does not need to teach a “national” history, one does need to teach a history based in the actions of governments and administrations. Can you talk about the Haudenosaunee without talking about the Confederacy’s government(s) or diplomacy? Can you write about the Cent Associés or the HBC without beginning with a notion of the Royal Charter? One can talk about, and should talk about the nation-state, without necessarily talking about the “nation”. Immigration experiences are incoherent without the context of the sovereign power of the state. I think you have it backwards: a state is the the body with a monopoly over the means of coercion: whichever power assumes that role is the state. The choice is never between reinforcing the will of the state and not doing so, but choosing between states. One cannot write history intelligeably about racial, class, and gendered experiences without talking about power, and to talk about power is to talk about the state. Even history or forms of history that nowhere explicitly rely rely on a notion of state power actually depend upon it implicitly. Anyway, it is not historians’ role to point to the way forward, but to say how we got here.